2018 Yamaha YZF-R6 ABS CONQUER ROAD Since its debut in 1999, the R6 has been the bike of choice for serious 600 class riders and racers. The R6 features a host of great features including ABS brakes with large 320 mm front rotors, 43 mm fully adjustable inverted forks and an R1 inspired body design that is sure to turn heads. The R6 is full of innovation and technology you won't find on the competitor's machinery. POWER Ultra-compact, lightweight, short stroke, 599 cc, DOHC, 16-valve, liquid-cooled, in-line four-cylinder engine with lightweight titanium valves produces incredible horsepower. Redline is set at an amazing 16,000 rpm. PERFORMANCE The YZF-R6 features a highly aerodynamic front fairing and windscreen that provides an 8% improvement in aerodynamic efficiency over the previous version. This contributes to a higher top speed during track riding. 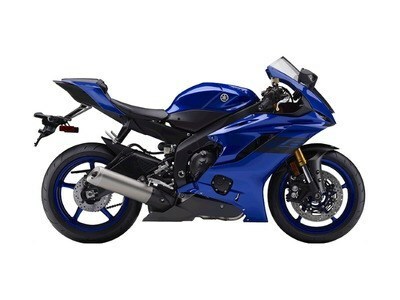 HANDLING The front end features YZF-R1 based easy-adjust KYB 43 mm inverted forks and large 320 mm discs with radial mount 4-piston calipers (ABS equipped.) Features may include: ENGINE Ultra-compact, lightweight, short stroke, 599cc, DOHC, 4-valve, liquid-cooled, in-line four-cylinder engine with lightweight titanium valves produces championship winning horsepower. Redline is set at an amazing 16,000 rpm. Compact "pent roof" cylinder head design features ultra-lightweight titanium valves. Valve adjustment intervals are every 42,000 kms. High flow intake & exhaust ports mean excellent power delivery at all rpms. Lightweight magnesium cylinder head cover & crankcase case covers. Direct ceramic composite plated "liner less" stand alone cylinder (cylinder is not part of the upper crankcase). Lightweight, short skirt, forged pistons. Lightweight crankshaft. High lift / high performance, hollow camshafts. Crankcases feature a "tri-axis" layout for the crank, main & drive axles. CHASSIS/SUSPENSION Compact, lightweight aluminum Deltabox frame offers an optimized rigidity balance for incredibly light & agile handling. New, slim design detachable CF die cast magnesium rear sub frame. Lightweight, aluminum "gull wing" type swingarm. New, fully adjustable, R1 based, 43mm inverted front fork with 120 mm (4.7") of wheel travel. Revised, fully adjustable Monocross link rear suspension utilizes a new KYB piggyback shock with 120mm (4.7") of wheel travel. ABS equipped, radial mount, mono-block 4-piston calipers squeeze new, larger 320mm dual front discs. ABS equipped, lightweight 220mm rear disc brake is squeezed by a single-piston caliper. Anti-lock braking system (ABS). New lightweight, 5-spoke cast aluminum 17" wheels. New, 17-litre aluminum fuel tank.